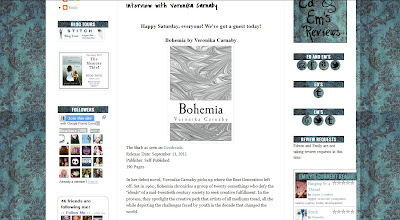 Don't miss Veronika's latest Q&A session with Edwin and Emily of Ed & Em's Reviews! In this segment, she discusses her current career endeavors and future aspirations at length, as well as some fun 'Quickies'! "With this story, I wanted to portray the fact that stepping outside of the boundaries can be ok and that it shouldn’t always be frowned upon, as it was and very much still is. That’s not only mirrored in the character’s actions and attitudes, but also in the freeflowing technique that the book was written in. " -- Veronika Carnaby on Ed & Em's Reviews. "I enjoyed this book a lot. What appealed to me was the way in which the story is narrated by the main character, Valerie. It feels as though you are sitting back relaxing and listening to an interesting lady bringing you through her life story and recollections of a time gone by. Veronika Carnaby has captured this style beautifully with her writing and you really wish that Valerie gets to follow her dream." "Though it was set in a period where I was a child it brought memories of that time. The attitude at the time permeated throughout the '60s and it was a great trip down memory lane. I encourage everybody to read this soon to be classic. Loved it!!! Peace---Veronika Carnaby Rocks!! Peace KT"
"I always love reading stories about journeys of discovery, and this book has it in spades :) It's well-written, the characters jump off the page, and it captures your imagination, doesn't let go until long after you've finished reading, and leaves you wanting more. Thumbs up!" "Wonderfully descriptive tale of friendships that blossom and change as young artists pursue their individual dreams. A marvelous story of self discovery which I highly recommend!" ©Veronika T, 2013. Unauthorized use & duplication of any content will result in legal action. Simple theme. Theme images by sndr. Powered by Blogger.